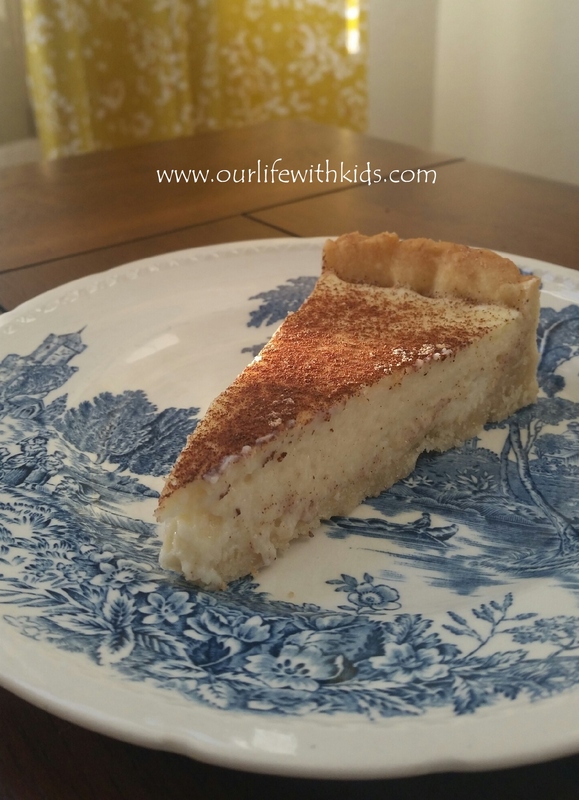 A few of my South African friends have been introducing me to all kinds of treats, and melktert is now one of my favorite desserts! I have been playing around with the recipe (and sharing test samples with my SA friends) over the past year, and finally got it right. There are many recipes for melktert, but this one is based on the feedback of my friends. Enjoy! Place flour, sugar and butter in a mixer with the flat beater attachment. Mix until mixture resembles fine breadcrumbs. Can also be made in a food processor. Add egg yolk and milk. Mix until liquid is just combined. If dough does not adhere to itself, it is too dry, add more milk a few drops at a time until dough is moist enough. Form dough into a flat disc, wrap with plastic wrap and chill in the fridge for 20 minutes. Butter your cake/tart/pie pan. I prefer to use a 10” springform pan. Press the dough evenly into the bottom and sides of the pan, then refrigerate for another 20 minutes. Preheat oven to 350°F. Line pastry with parchment paper (not waxed paper!) and fill with pie weights, uncooked rice or dry beans. Bake for 10 minutes; remove paper and weights and bake for another 10 minutes. Allow to cool completely. Measure three-quarters of the milk into a saucepan, add the cinnamon and heat to just below boiling point. Set aside to infuse for about 15 minutes. Mix together the remaining milk, egg yolks, flour, cornstarch, sugar and baking powder. Strain the cinnamon-flavored milk and slowly add to the mixture, being careful not to cook the egg. Pour into a clean saucepan and cook over medium heat, stirring, until the custard thickens, approximately 5 minutes. Remove from heat, and whisk in the butter and vanilla extract. Cool to room temperature. Oven should already be set to 350°F. Whisk the egg whites stiffly and fold into the custard. Pour into pastry shell and bake for 10 minutes. Reduce oven temperature to 325°F and bake for about 25 minutes more, until the filling is set but still wobbles when pan is shaken. Sprinkle with ground cinnamon mixture and serve warm.